Getting the hang of making haggis or the knack of preparing knockwurst isn't nearly as tough as is commonly believed. The Sausage-Making Cookbook explains this traditional kitchen craft and shows exactly how to go about it. Step-by-step instructions help make beginners into masters of the sausage-making art. Tips on equipment and techniques enhancing the 230 recipes make this much more than just a cookbook. 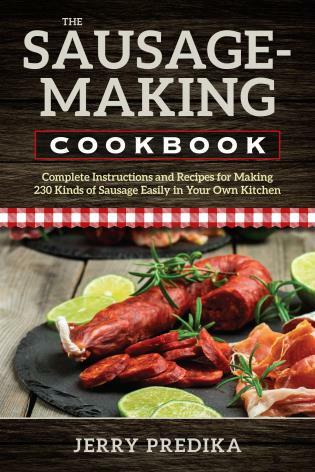 The Sausage-Making Cookbook is for the increasing numbers of people who want to provide for themselves. Eliminate harmful nitrates and nitrites, artificial preservatives, and stuffers by controlling the raw materials that go into homemade sausage. Jerry Predika, well-known contemporary Russian photographer and artist, also excels in the culinary arts. An accomplished cook trained in the customs of his Slavic ancestors, the Santa Cruz, California, resident has gained a reputation preparing his old-world specialty recipes.